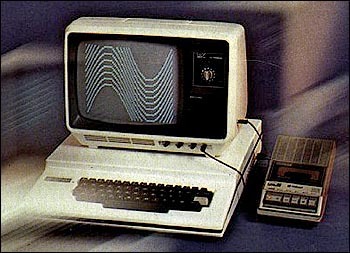 Brazil produced several Tandy Model I and III clones. Among them, the DGT-100 and DGT-1000 which were manufactured by DIGITUS Ind. Com. Serv. de Eletr�nica Ltda and sold only in Brazil. Although their cases looked like an Apple II, both models were compatible with the Tandy Model I and III and featured a Level II BASIC interpreter. The DGT-100 had a monochrome video output while the DGT-1000 (introduced in 1984) could display 16 colors in 256/192 mode on a PAL-M TV set. This monitor is actually an adapted Philips B/W TV. If you remove the cables from the jack slots (as see in the picture), you can watch TV. To run a CP/M OS I needed to install an additional chip inside the computer and more memory. The reset button, on the right side of the case, could be easily pressed accidentally. This was very annoying. Thanks to Rodrigo and Sando from Brazil for this information. see more Digitus DGT100 / DGT1000 Ebay auctions !